He is responsible for most of the music production "CRACKED-FUZZ-ROCKET"
"SHU" have formed a new band ! 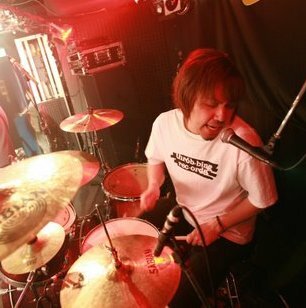 "shu (Drum/ composer/ Arranger) has formed a New rock band. Activity detail will continue to soon up is determined. Stay tuned! There is also Facebook! Friends application welcome. "CRACKED-FUZZ-ROCKET" is music and non-music culture, without being caught in the genre, from the desire to want to work, and we formed the band in Japan. ”CRACKED-FUZZ-ROCKET” Got started after “ko-ko”s Breaking up! ”ko-ko” Got Restarted after CROMAGARAGE's Breaking up! Performed at live concert events more than 300 times. One and half year past… after the end of CROMAGARAGE, one BEST played band at "audioleaf*,"
ko-ko re-appeared with their virgin album "Our Stories"
Soon a Big Sensation around "ko-ko"!! Over 10,000 plays within ONLY a month!! within a month, the virgin single "Our Stories" played more than 10,000 times and got the FIRST position! Oct 2011, Started twitter and now have more than 7,000 followers! !